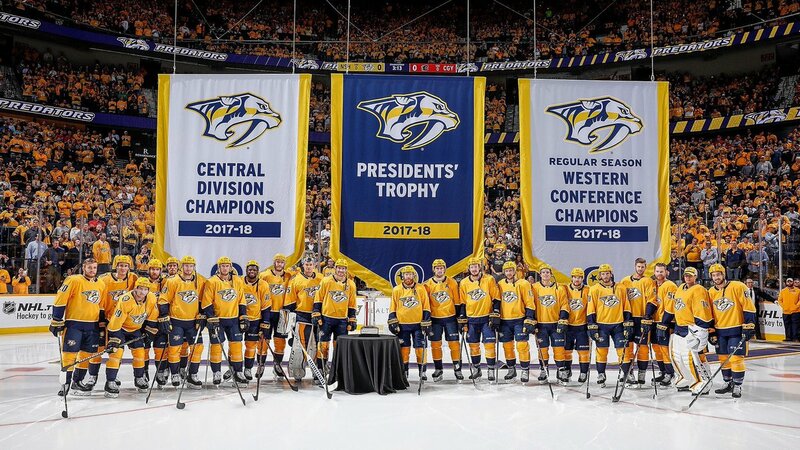 Generally speaking, teams take down their Western Regular Season Champions banner when they win the Western Conference Finals. (See SJ Sharks). Not put one up for the regular season a year after they won the Western Conference Finals. And with a Presidents Trophy. Overkill. Utter madness. Lmao a bogus ceremony for 3 banners at once with 0 actual significance between them. I'm glad to see these clowns have wasted no time grabbing the title of saddest rafters in hockey immediately after the Capitals got their act together. The leafs keep scoring in bunches. Matthews is of to a crazy start. Shanahan wants the kids to take hometown discounts but if they keep this up it won't help contract negotiations with Matthews and Marner. It's gonna be an exciting summer in Toronto that's for sure. Is it wrong I want Philly to offer sheet for one of those guys or Nylander? After all, look how that worked out for the Perds and Weber. Of course not. I also pull for offersheets if it doesn't involve one of our guys being offersheeted that is. Tim and Sid laughing their arses off. Facepalm Nashville. Precisely. The hockey gods gave us our offersheet hell over a decade ago. Time for someone else to suffer. They deserve a good barracking for these. And more. Even the Charks banner raisings aren't this bad. Rags beats Sharks in OT. Vegas lost again vs Pens. Sharks were up 2-1 very late too. Nice. Can anyone explain why there are no games on the schedule tomorrow? Why did none of the players in the leadership group on that team say anything about this...surely they must be embarrassed? Though they aren't embarrassed by their team mates flopping all over the ice so I guess not. It's my birthday. Not even kidding. Why would you not want hockey being played on your bday? The early schedule seems wonky to say the least. Some teams have played five games while a few others have only played two. I recent found out Edmonton was over sees but Florida only has two games so far. Yes. Bettman is terrible. Seriously, you're a week and a half into the season and just getting fans back into it. People are excited for hockey. And then you decide to allow there to be a day with no games. It's goofy. So I can sleep all day ! Duh ! Me like others expected this. They were running on full octane based on the probable coaching motivated notion of “we are all castaways so let’s show them all”. Well now that they have settled in Vegas they are no longer castaways so that psychological push is no longer there hence they have fallen back to earth. Mentally they prob are still recovering from playing so hard each and every game last year, it was bound to catch up to them. That and they relealized they are living in Sin City where there are countless distractions, clearly the most out of any other team it’s going to take a mighty focused player to stay on track. Good luck.... not!! Florida’s Mike Matheson will have a hearing tomorrow for interference/ unsportsmanlike conduct on Vancouver’s Elias Pettersson. DOWN A MAN: Jets defenceman Dustin Byfuglien is out day-to-day with an upper-body injury and will miss Sunday's game against the #Hurricanes. Florida’s Mike Matheson suspended two games for interference/unsportsmanlike conduct on Vancouver’s Elias Pettersson. Who is Doug Gilmour ?